The FA Cup Final programme will be made available for all, with a free online version also boasting a highlights reel of classic goals from football's most famous domestic cup competition. 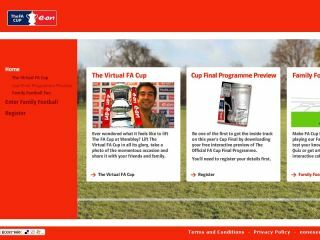 The programme is being made available by FA Cup sponsors E ON, with the energy company putting the content on www.familyfootball.co.uk. Although you may expect digital programmes to be frowned upon by the collectors – one of them, Robert Stein, told PA that he was pleased to see the move. "Programme collecting is a wonderful way of understanding the history of the game," said Stein. "You can't halt the tide of inevitability and online programmes will help promote the hobby of football memorabilia collecting to a worldwide audience." It's hardly the most mind blowing idea of all time - magazines have been going online for years – but it does indicate a growing desire for digital content.